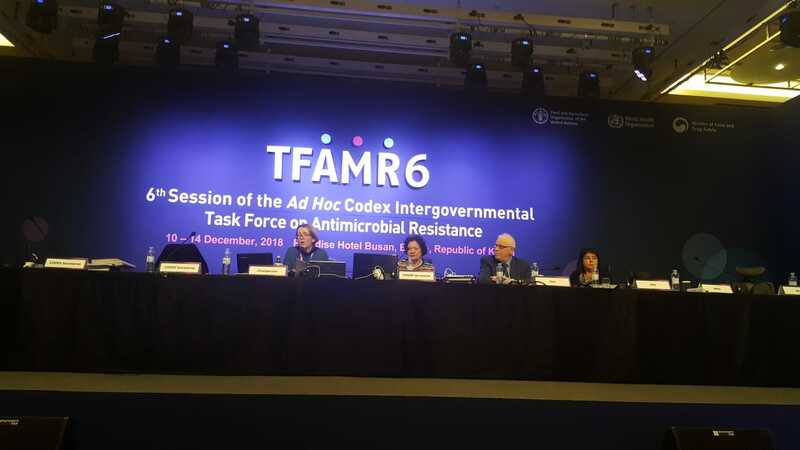 The role of animal nutrition and feed strategies and options for reducing the need to use antimicrobials in animal production was highlighted in a side event during a meeting of the Ad hoc Codex Intergovernmental Task Force on Antimicrobial Resistance that took place in Busan, Republic of Korea, from 10 to 14 December 2018. The speakers summarized the current state of the art and recent insights on how diets, gut health and the immune system interact and could contribute to disease resilience. The event also highlighted the work of FAO to promote these options to stakeholders in the feed sector and the activities of the International Feed Industry Federation (IFIF). At a global level, an inappropriate and excessive use of antimicrobials in human and animal health, as well as in animal production, is considered as a major driver for the development of antimicrobial resistance (AMR). Antimicrobials are used in animal production for disease prevention and treatment and for growth promotion. Despite the reduction of the use of antimicrobials in many countries, antimicrobial consumption in the livestock sector is expected to rise by 67 percent by 2030, and to nearly double in Brazil, Russia, South Africa, India and China, if no additional measures to reduce their use are taken. One of the main objectives on the global agenda is the reduction of the inappropriate use of antimicrobials. FAO has recommended that medically important antimicrobials should only be used in food-producing animals to treat diseases and only under strict circumstances should they be used to prevent an imminent threat of infection. FAO recommends phasing out the use of antimicrobials for growth promotion. However, in order for this to happen without compromising food security and economic sustainability, farmers need to implement additional measures that promote a reduction in the use of antimicrobials while maintaining productivity. A wide range of practices and innovations that focus on reducing infection pressure in the environment and on optimizing disease resistance and resilience of animals are available. They contribute to animal health and welfare, while stimulating productivity. These include the use of adapted genetic resources; animal husbandry, hygiene and biosecurity; targeted nutrition and resilience promoting diets; health support, such as targeted tailor-made vaccination schemes, and animal welfare, including minimizing social or environmental stress. Modern animal nutrition strategies and options are now recognized as an integral part of sustainable animal health, welfare and production. Adequate feed regimes stimulate gut functions, stabilize the intestinal microbiota and strengthen the mucosal barrier. Specific nutrients can influence functions critical for host defence and disease resistance and ensuring feed safety reduces, or even excludes, exposure of farm animals to pathogens. “Keeping animals healthy by means of nutritional programmes based on an increased understanding of the close correlation between gut health, the immune system and the animal’s resilience to infectious diseases and environmental stressors is a major objective of the feed sector and a unique opportunity to reduce the use of antimicrobials,” said Prof. Johanna Fink-Gremmels, from Utrecht University. With these benefits in mind, this event concluded that tailored animal nutrition and feed strategies can lead to a significant reduction in antimicrobial usage, whilst maintaining high productivity and animal well-being. It was encouraging to note that in several countries, restrictions on the use of antimicrobials in food-producing animals has been positively associated with a reduction in the prevalence of (multi)-resistant bacterial pathogens.